If you’re engaged in the transportation of hazardous waste materials, you know the importance of understanding the risks they pose to human health and safety. 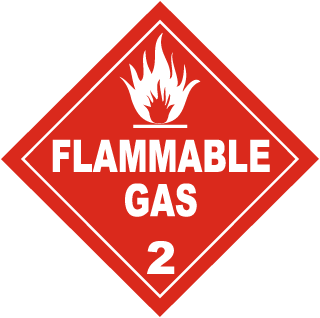 The U.S. Department of Transportation specifically outlines what constitutes a Class 2 Compressed Gas in order to ensure the risks of storing and transporting these hazardous waste materials are minimized. If you have any question at all as to whether the material you want to ship or dispose of is a compressed gas, you should contact the U.S. Department of Transportation (DOT) or work with a certified hazardous waste disposal agency that has the experience to ensure your company’s hazardous waste is properly managed. Division 2.1 includes flammable gases that are found to be ignitable when comprising 13% or less of a room’s gaseous volume. What makes these gases especially dangerous is the prevalence of igniters found in the workplace. Even small electric sparks or strong friction can be enough to produce a powerful explosion. 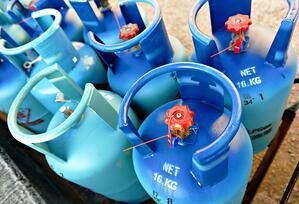 As a result, storage and transfer of these flammable gases require great care. These dangerous materials are marked with a red placard featuring a flame icon. Gases that are neither fire hazards, nor toxic upon inhalation, are divided into the 2.2 subdivision. These gases still pose a risk to human health, however, based on their natural behavior. Large volumes of asphyxiant gases, like helium and nitrogen, prevent human lungs from accessing oxygen. The worst case scenario result of exposure to Division 2.2 gases is death by suffocation. These dangerous materials typically are marked with a green placard featuring a gas canister symbol. However, there is an optional yellow placard for compressed Oxygen in either the gas or liquid state. Though Oxygen is considered to be non-flammable, it is required for combustion to take place. If there are high concentrations present, this greatly increases the risk for and intensity of combustion. Gases proven toxic to humans (or animals in lab testing) are designated as inhalation hazards. These substances require the highest level of care during transport and disposal due to their deadly properties. It’s important for your company to enlist professional help when it’s necessary to dispose of any gases that fall under this subdivision. These dangerous materials are marked with a white placard featuring a skull and crossbones symbol (otherwise known as the international toxic/poison symbol). If your business works with Class 2 Compressed Gases, it’s important to make sure they are transported and disposed of properly. Offering comprehensive training programs for employees who are exposed to hazardous gases can help promote the highest safety standards in the workplace. Avoid hefty fines, liability from danger, and injury to your employees and others. It’s also important to note that when storing different gases in nearby areas or in the same area, a chemical reaction can occur. For example, as noted above, though Oxygen is not considered flammable, it is required for combustion to occur. Therefore, certain substances should be segregated from one another, even during disposal. Working with an experienced hazardous materials services company can ensure proper and safe disposal. It’s also important to work with a company that provides a 24-hour hazmat emergency response should an emergency occur involving Class 2 Compressed Gases. It goes without saying that handling Hazardous Waste Class 2 Compressed Gases can be extremely dangerous. They can pose serious hazards and regulation violations if not properly handled, and if a chemical reaction occurs, the damage to human health can be catastrophic. Working with a licensed hazardous waste disposal company can help you determine the correct course of action, ensuring you, your employees and the public are safe during the disposal of these gases.